AN ONLINE retailer has been called out for fat shaming and has caused outrage among customers after selling a grey jumper with a "disgusting" slogan on it. 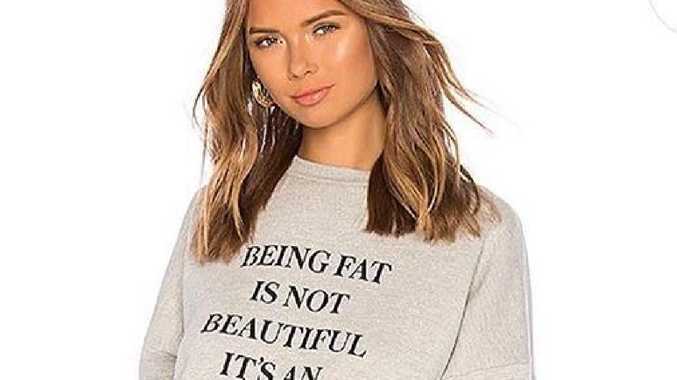 The seller, Revolve, has received major backlash for selling a jumper that reads: "Being fat is not beautiful it's an excuse." Pictures of the offending top quickly circulated on social media and people were quick to share their disgust at the item. "Body shaming isn't right & the fact the company would make something like this is disgusting," one person wrote. Another said: "Is this... a sick sick joke?" "Looks like @REVOLVE hate money as much as they hate 'fat' people. Also - this runs to an XL, seems like a contradiction," one pointed out. The jumper was being sold for £162 ($AU295) but has since been removed from the website. The retailer has since claimed the jumper was part of a cyber bullying campaign and celebrities were asked to submit the most "abusive and controversial comments" they had been sent to appear in a collection of clothes. "The purpose of these sweaters are to call attention to cyber bullying and trolling and proceeds of the sweater are being donated to charities to prevent cyber bullying," Revolve reportedly told one angry customer.